Styletech PS Label Stock is manufactured and sold using a variety of stock PVC films, adhesive and release liners. 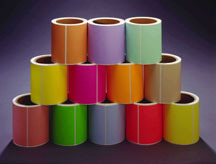 We also provide reflective, photoluminescent and specialty label stock. Our different face films offer advantages over traditional pressure sensitive face stock films and papers. We can provide a variety of different adhesives with different characteristics to satisfy your requirements. Some of our best adhesive solutions include permanent, removable, cling, and low dyne. We look forward to the opportunity to serve you. Custom widths as narrow as 1"
For 30 years, we have been coating and slitting a wide variety of films for standard and specific applications. We understand that our customers are buying more than a product…they are buying solutions and performance.